iPhone and iPod touch users who want to listen to stream music through their mobile device. Slacker is the latest to throw its knit cap into the ring, introducing its Slacker Radio program to the App Store. Slacker Radio gives iPhone and iPod touch users running the iPhone 2.2 software update access to Slacker’s entire music library. That allows users of the free app to listen to more than 100 stations programmed by experts and more than 10,000 stations dedicated to specific artists. Users can also create their own customized stations via the iPhone. 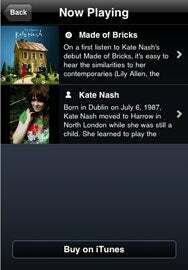 Among the other features included with Slacker Radio are artist biographies, album reviews, and peak-ahead song previews. Slacker touts its app as a great way to uncover new and undiscovered music. Another recent addition to the App Store, NoteWorthy also helps you discover new music. The $1 app from Roy Kolak helps you remember artists and songs that you want to listen to later. When someone recommends a song to you or you hear a track somewhere that you like, use NoteWorthy to let it remember the artist’s name. You can then get details from Last.fm such as similar artists, biographies, album names, and track names. NumPad, from Edovia: The $3 app, which turns your iPhone or iPod touch into a wireless numeric keypad, can connect to a computer via VNC; it includes a connection manager that automatically scans Macs running OS X.
Plan2Retire, from SwampBits: The $2 retirement-planning app helps you plan for your golden years by letting you define up to four different market scenarios to see how each one does at meeting your retirement goal. Have2P, from AT&T Interactive R&D: The free, editable restroom locator show nearby locations on a map and scans for information such as patrons-only or changing tables. Logbook, from Sandy Cove Software: The $5 utility logs your fuel fill-ups, efficiency, and vehicle maintenance details. Incognito, from Dan Park: The $2 anonymous Web browsers lets you search the Web without leaving any kind of history. Audio Concise Oxford English Thesaurus, from Mobile Systems: The $20 thesaurus features more than 365,000 alternative words and 60,000 high-quality audio recordings with proper pronunciations. Pillboxer, from Nixwire: The $1 app lets you track all of your medications, vitamins, and supplements. FlightTrack, from Ben Kazez: The $5 flight tracking app now includes an e-mail feature for sending a flight’s status as well as international coverage. Contact Tool, from Alessandro Levi Montalcini: The $2 app for searching, sorting, and inspecting contacts now offers full search on all contact data and lets you filter searches for currently displayed contacts.